Library and Archives Canada (LAC) is about more than just “stuff”; it is also the home of leading experts in Canadian history and culture. While LAC archivist Jennifer Anderson was at the Canadian Museum of History (CMH) on an Interchange Canada agreement, she co-curated the popular exhibition, “Hockey.” During the exhibition research, she consulted LAC staff and experts across the country. LAC also loaned 30 artifacts to the museum for this exhibition, and offered digital copies of hockey images from its vaults. You can see the results that teamwork brings! Having run from March 10 until October 9, 2017 in Gatineau, the exhibition will start up again on November 25, 2017 (the 100th anniversary of the NHL) in Montréal at Pointe-à-Callière, before continuing its cross-country tour. …or two…or a few hundred. Biographies, autobiographies, histories—comic books, and novels for young people; we read those, too! And as many newspaper and magazine articles as we could find. The exhibition team swapped books like fans trade hockey cards! Books moved us, pushed us, challenged us and at times even frightened us. I cried and laughed over them, took notes and then forgot to because I was too engrossed in the reading. We read about big personalities like Maurice Richard and Pat Burns, about game changers like Sheldon Kennedy and Jordin Tootoo, and about Ken Dryden’s observations of young people and families in the game. We were deeply inspired by Jacques Demers’ work to advance youth literacy initiatives. Borrowing literacy teachers’ best practices, we chose to use fonts of different sizes and based the look of our exhibit on the style of a hockey card. The goal: make reading fun and accessible. One of the first books I read was Paul Kitchen’s fascinating tale of the early history of the Ottawa Senators, Win, Tie or Wrangle (2008). Kitchen did much of his research from a desk at LAC, and he spun some of his discoveries into an online exhibition, Backcheck. From his book, we were able to identify a little-known shinty medallion depicting a stick-and-ball game, which took place on the grounds of Rideau Hall in 1852. Drawing on Kitchen’s footnotes, I reached out to the Bytown Museum, and was thrilled to learn they would be happy to lend the artifact for the exhibit. The conservators at the CMH buffed it up a bit, and images of this early piece of hockey history were included in the exhibition souvenir catalogue. Front and back views of the silver New Edinburgh Shintie Club medallion, 1852, Bytown Museum, A203. Canadian Museum of History photos, IMG2016-0253-0001-Dm, IMG2016-0253-0001-Dm. Paul Kitchen would probably be the first to acknowledge that any research project is a team sport, and our exhibition team reached out to many experts who had earlier worked with Kitchen, or had been inspired by him. Within LAC, Normand Laplante, Andrew Ross, and Dalton Campbell have continued the tradition of sports history, and their archival work led us to explore LAC’s collections for material to place in the exhibit. At the CMH, there are hockey experts galore, but Jenny Ellison is the “captain.” The team brought on Joe Pelletier as a research assistant to scout out images and hidden bits of information, based on the work he had already provided voluntarily. Hockey researchers and curators from across the country sent us artifacts, images and information. Loaning originals is such an important part of the diffusion of any collection. Thirty individual items were loaned by LAC to the CMH for this exhibition. The LAC Loans and Exhibitions Officer admitted to being particularly touched by the team’s interest in The Hockey Sweater by Roch Carrier (now a popular animated film). As a child, she had received this book from one of her best friends, and only recently located this much-loved book. She has since shared it with her own children, and enjoyed telling them about her own childhood memories of this popular story about hockey. In the early research period, Richard Wagamese’s book, Indian Horse, hit a chord and resonated with the team. 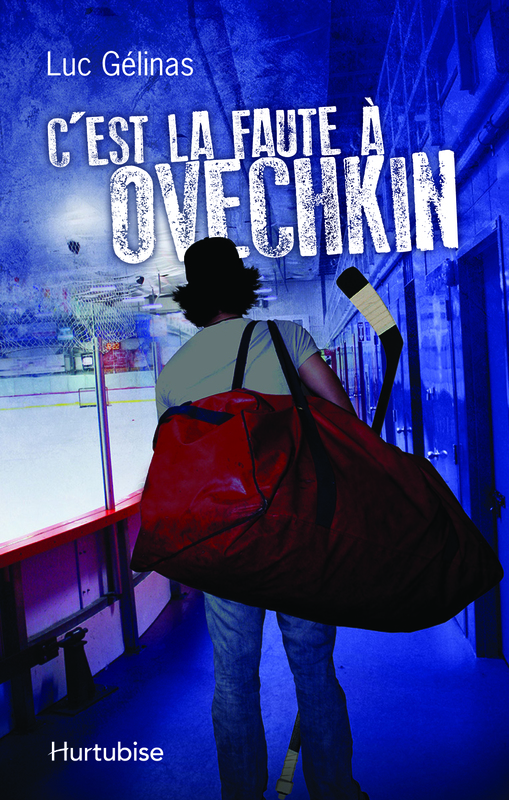 Michael Robidoux’s book on Indigenous hockey, Stickhandling Through the Margins, motivated us to ensure that space be put aside for the full integration of Indigenous voices in the game, whether from the early leadership of Thomas Green, or through the artwork of Jim Logan to spark discussion of hockey in society. Drawing on Carly Adams’ book, Queens of the Ice, the museum acquired and exhibited a rare Hilda Ranscombe jersey. We also read the footnotes in Lynda Baril’s Nos Glorieuses closely, and as a result were able to secure a number of important artifacts that were still in private collections, including a trophy awarded to Berthe Lapierre of the Montréal Canadiennes in the 1930s. And when we read about Hayley Wickenheiser skating to school in the drainage ditches along the roadside, building up the muscles that made her a leader in the sport, on and off the ice, we put her story near the centre of the exhibition. A few of our favourite books found their way directly into the museum cases, to tell their own stories. For instance, where we highlighted the role of the team-behind-the-team, we gave Lloyd Percival’s book The Hockey Handbook a central spot in the case. Gary Mossman’s recent biography of Percival was a big influence here, and in particular, I was fascinated by the powerful impact Percival’s book had on how hockey players and coaches approached the game. Imagine a time when players ate more red meat and drank beer the night before a game, rather than following Percival’s advice to eat yogurt and fresh fruit! And yet it was not that long ago! Apparently the book was taken up by Soviet hockey coach Anatoli Tarasov, and we saw its impact on the ice in 1972. Percival also had an interesting perspective on burnout, or “staleness” as he called it—a theory that has application for both on- and off-ice players. Stephen Smith, author of Puckstruck, lent the museum collectible and fun cookbooks that teams published—this spoke to the overlap between popular fan culture and the down-to-earth and very practical realities of nutrition in high-performance sport. The Museum of Manitoba loaned bookmarks that had been distributed to school kids by the Winnipeg Jets, each with a hockey player’s personal message about the importance of literacy in everyday life. These were displayed next to the hockey novels and comic books from LAC. The exhibition team wondered about how to tackle prickly issues like penalties, violence and controversy. Then we hit on the most natural of all approaches—let the books and newspaper articles tell the stories! So next to an official’s jersey, you will find our suggested reading on the ups and downs of life as a referee, Kerry Fraser’s The Final Call: Hockey Stories from a Legend in Stripes. In the press gallery section, the visitor gets a taste for the ways that sports journalists have made their mark on the game. Next to a typewriter, an early laptop and Frank Lennon’s camera, we placed Russ Conway’s book Game Misconduct: Alan Eagleson and the Corruption of Hockey. To capture the importance of youth literacy, we carefully chose books that we tested ourselves for readability. Literacy became a thread running through the exhibition, in ways big and small. Thanks to all the librarians who helped us get our hands on these books! It may be too ambitious, but I continue to cherish the hope that the exhibition and this blog will inspire you to pick up a book, visit a library, and enjoy the game as much as we did. Wishing to bring a fresh read to the sport, Jenny Ellison and I are editing a group of new essays on the sport, to be published in 2018 (Hockey: Challenging Canada’s Game — Au-delà du sport national) Check it out! Do you have a favourite book about hockey? Let us know in the comments. Jennifer Anderson was co-curator of the exhibition “Hockey” at the Canadian Museum of History. Currently, she is an archivist in the Archives Branch at Library and Archives Canada. Library and Archives Canada (LAC) currently has an exhibition at 395 Wellington Street in Ottawa, which runs until January 22, 2016. Hockey Marching as to War engages viewers in the many stories of hockey players’ involvement in Canada’s First World War effort—from the men who enlisted and served overseas to the women who took up sticks at home. A particularly fascinating story is the emergence of highly successful military hockey teams. 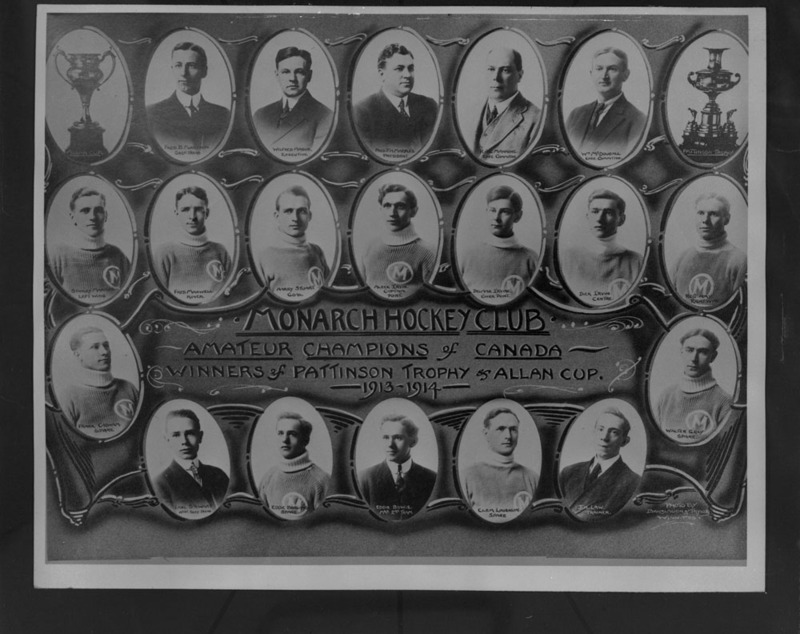 In 1916, Winnipeg’s 61st Battalion won the prestigious Allan Cup—the senior amateur hockey championship—and Montreal’s 87th Battalion was good enough to play an exhibition game against Montreal professionals, including players from the Canadiens. 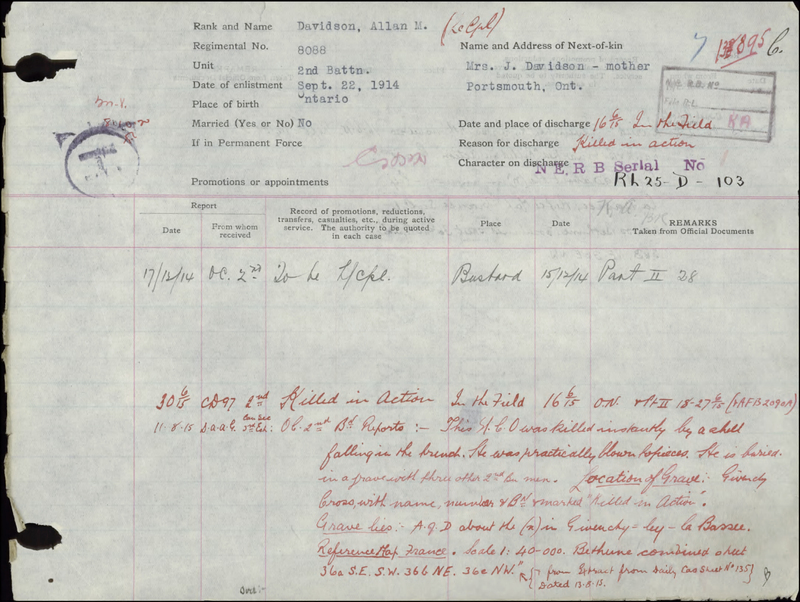 No military team was more famous than the 228th Battalion, whose history is there for all to see in LAC’s rich collection of government records. 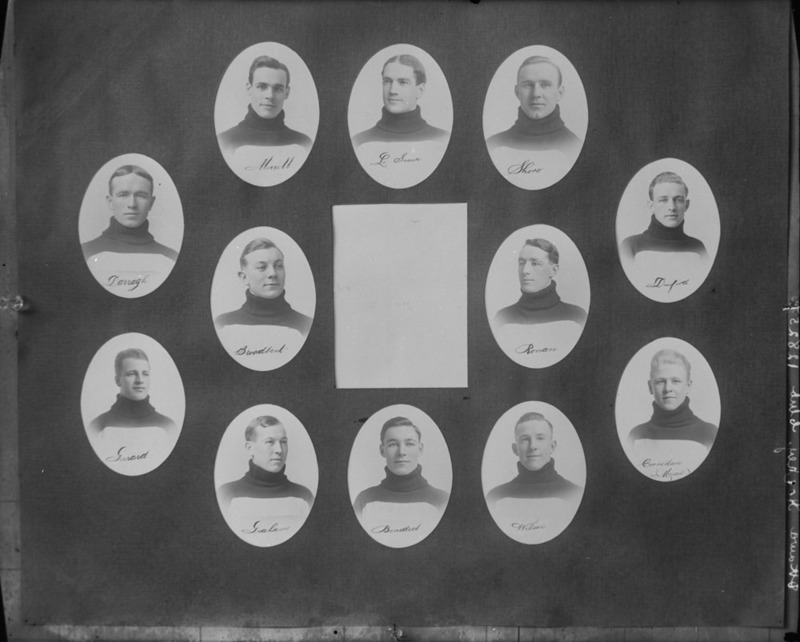 Known as the Northern Fusiliers, the 228th mustered in North Bay, Ontario, under the command of Lt.-Col. Archie Earchman, and was so successful recruiting talented hockey players that in the fall of 1916 it was invited to join the National Hockey Association (NHA), the main professional league and forerunner of the National Hockey League. In 1911, Frank and Lester Patrick, hockey players and entrepreneurs, built the first two artificial ice rinks in Canada—the Denman Arena in Vancouver, and the Victoria Arena in Victoria. The Denman Arena was the largest arena in Canada at the time with a seating capacity of 10,500. The rinks were constructed to be the main rinks for the new Pacific Coast Hockey Association games, created by the Patrick brothers to bring professional hockey to western Canada and to compete with the National Hockey Association (predecessor to the National Hockey League). According to Library and Archives Canada’s database Canadian Patents, 1869-1919, Frank Patrick applied to the Canadian Patent Branch to patent the refrigeration system for their rinks in 1913. The patent seems to have been granted in June 1914, although the application does have “cancelled” stamped on it. Recognized as the leaders in the development of artificial ice hockey rinks in Canada, Frank and Lester Patrick are also credited for implementing many rules of hockey that are instrumental to how the game is played today. For more information on the opening of the Denman Arena and the creation of the Pacific Coast Hockey Association, please see our virtual exhibition, Backcheck: a Hockey Retrospective. The first hockey goals consisted of two rocks, and later posts, which were placed at each end of the rink. The goal posts were first eight feet apart, then reduced to the 6-foot width still used today. 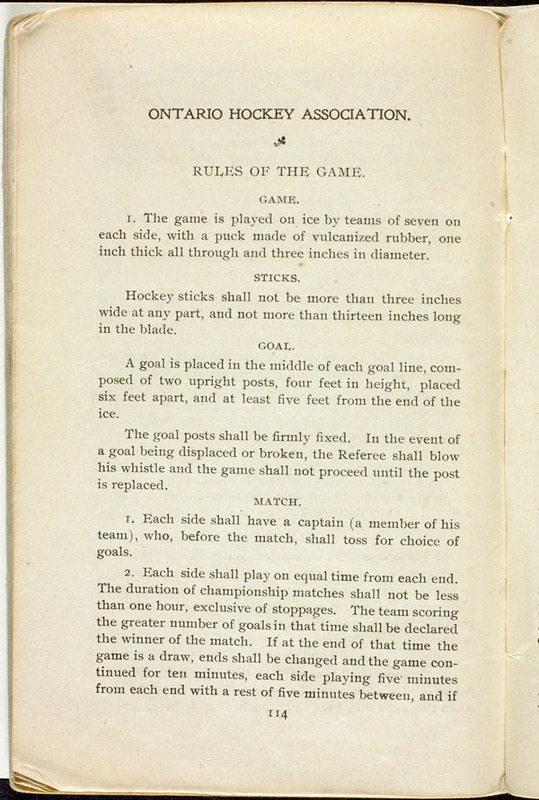 Ontario Hockey Association rules as found in Hockey: Canada’s Royal Winter Game. In the 1890s, a number of hockey leagues started to experiment with the use of fishing nets attached to the posts to avoid arguments over goals. In 1899, the newly-created Canadian Amateur Hockey League officially adopted the use of hockey nets during their games. The goal consisted of a net attached to a rope connecting the top of each goal post. 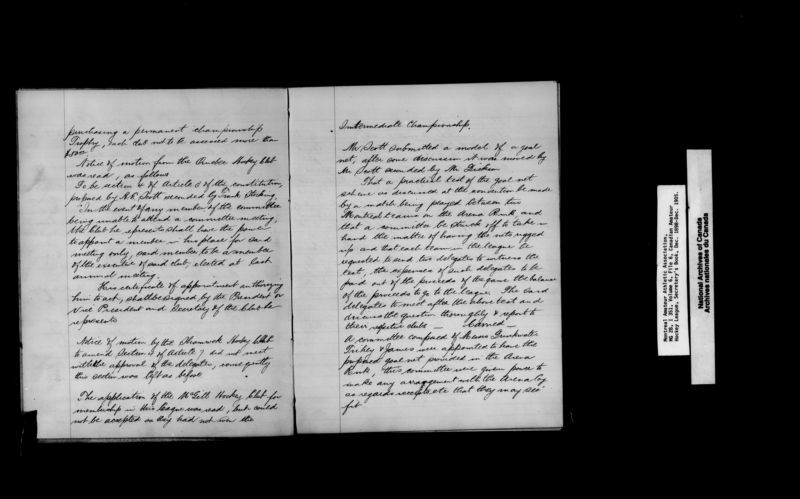 Minutes of the annual meeting of the Canadian Amateur Hockey League, December 9, 1899 (MIKAN 100095 or on the Héritage website, image 95). 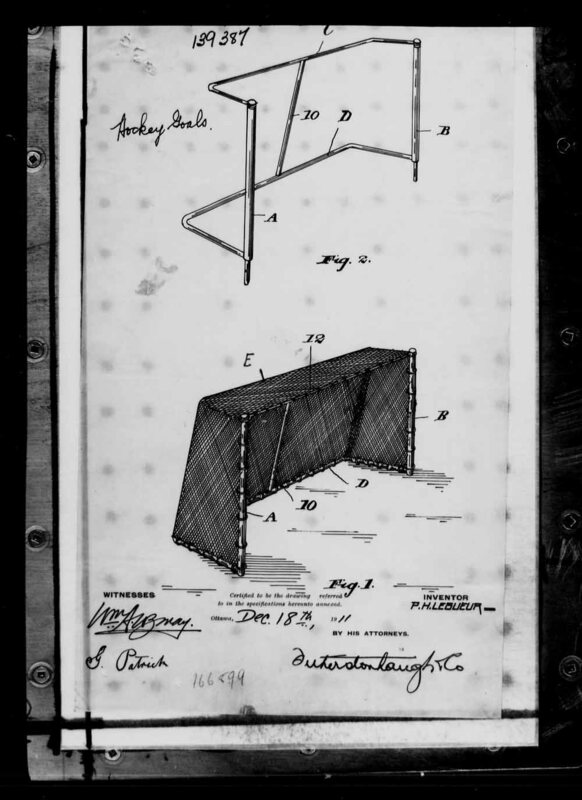 In 1911, Percy LeSueur, one of the best and most innovative goaltenders at the time, submitted a patent application to improve the hockey net. 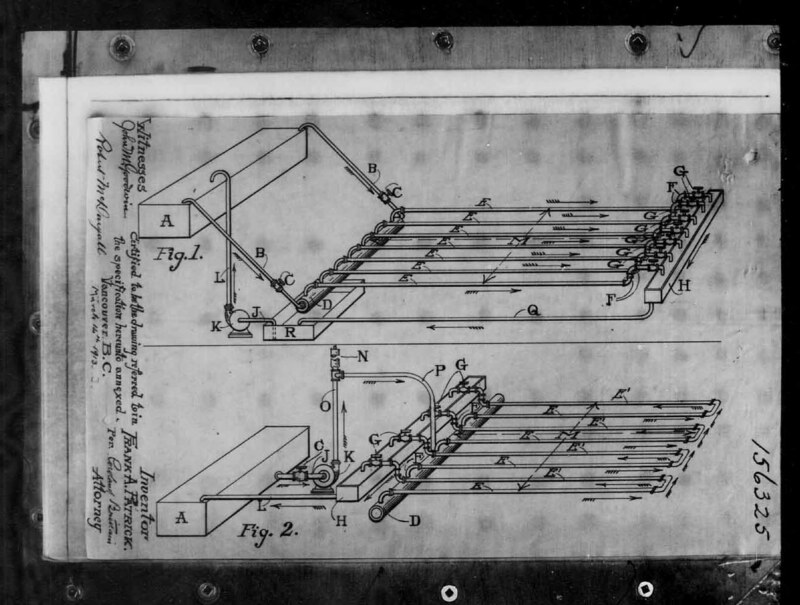 According to his application, the objective of his patent claim was to “enable much greater accuracy in deciding scores to be maintained.” LeSueur’s proposed hockey net improved on the existing goal type where the supporting top bar was set back a number of inches from the goal line and allowed a shot from close range and at an upward angle to go over the bar, even if it crossed the goal line. The patent was granted to Le Sueur in 1912 and the concept behind his patent remains the foundation for the hockey goal still used today. For more information on the Canadian Amateur Hockey League Association, please consult the Montreal Amateur Athletic Association fonds held by Library and Archives Canada. 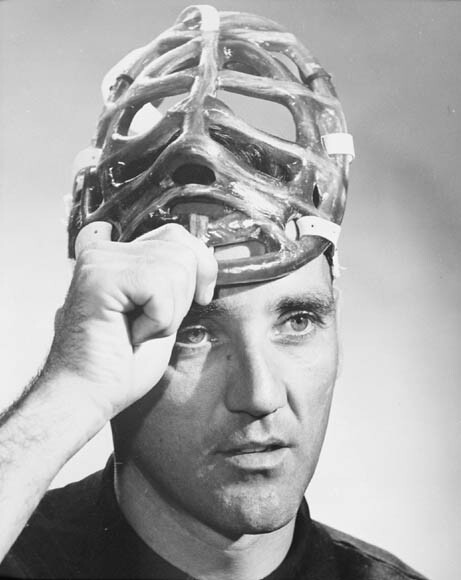 In November 1959, the all-time great goaltender, Jacques Plante, would change the hockey world by starting to wear a face mask on a regular basis. Until then, goaltenders did not use protective masks. A few notable exceptions included Elizabeth Graham who used a fencing mask in a hockey game in 1927 and National Hockey League (NHL) goaltender Clint Benedict who used a leather mask in a few games in 1929. 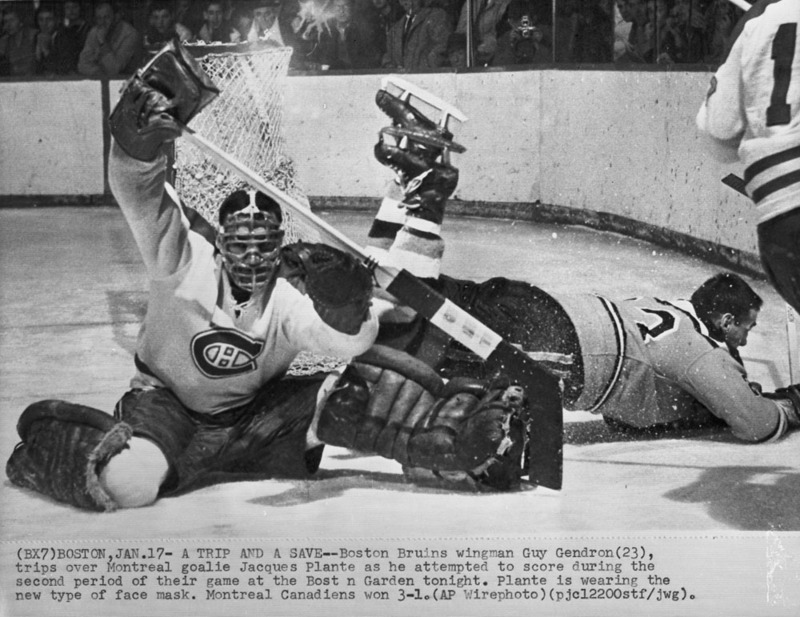 Plante of the Montreal Canadiens had experimented since the mid-1950s with different masks in practices and exhibition games to protect himself from pucks and sticks. On November 1st, 1959, after suffering a broken nose and cuts to the face during an NHL game against the New York Rangers, he returned from the dressing room with a mask created by fibreglass specialist, Bill Burchmore. In January 1960, Jacques Plante began wearing a new lighter mask, commonly known as the “pretzel mask,” built by Burchmore and consisting of 540 woven ends of fibreglass yarn. Other goaltenders would follow suit and the mask soon became a standard piece of equipment for a goaltender. Jacques Plante would continue improving goalie masks and created his own mask-making business towards the end of his hockey playing career. 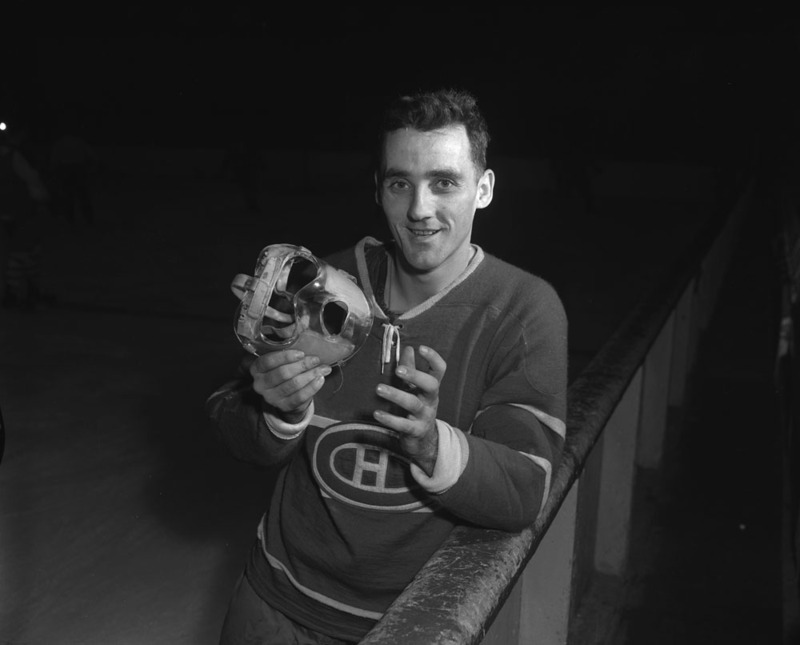 For more information on Jacques Plante and his innovations, consult the Jacques and Caroline Raymonde Plante fonds held at Library and Archives Canada. Hockey is so popular in Canada that a number of cities claim to have started, or invented, the game. Some notable claimants are the cities of Halifax, Windsor and Kingston. 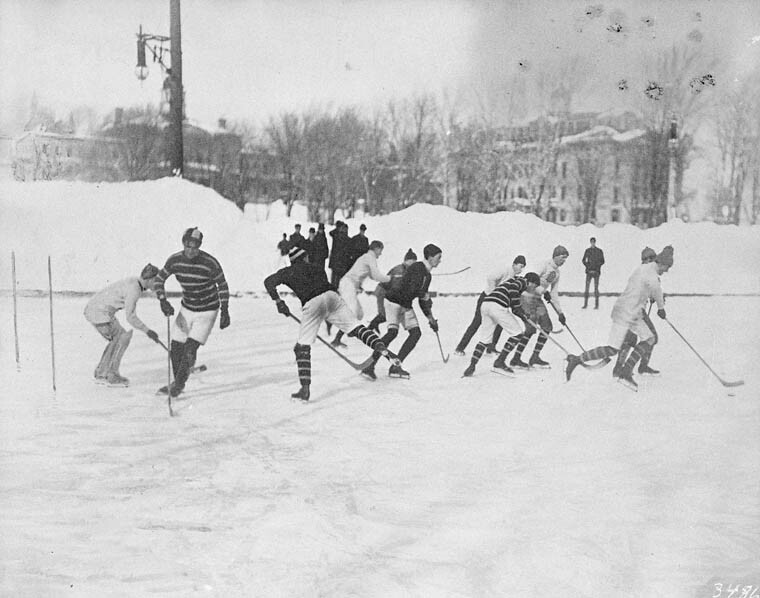 There are early recorded events, such as the 1875 indoor game in Montreal at the Victoria Skating Rink, and the 1883 Montreal Winter Carnival hockey tournament where teams from Ottawa and Quebec City participated. 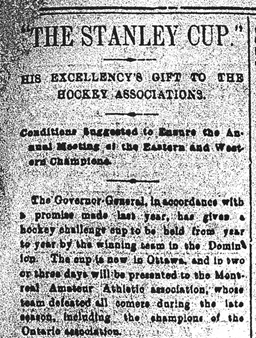 There were even amateur associations formed to promote the growth of the game in Canada. Happy 100th birthday, Hockey Canada! On December 4, 2014, Library and Archives Canada (LAC) is celebrating the 100th birthday of the national governing body for amateur hockey in Canada. The Canadian Amateur Hockey Association (CAHA) was founded in December 1914 in Ottawa, Ontario as the national administrative, regulatory and developmental body for amateur hockey in Canada. Representation at the founding meeting included the provincial hockey associations of Alberta, Saskatchewan, Manitoba and Ontario; the Montreal City Hockey League; the Canadian Intercollegiate Hockey Union; the Allan Cup Trustees; the Canadian Olympic Association; and the Amateur Athletic Union of Canada. Other groups affiliated with the CAHA after its creation include the Quebec Amateur Hockey Association in 1919, the Ottawa District Amateur Hockey Association in 1920, the Maritime Amateur Hockey Association in 1928, the Newfoundland Amateur Hockey Association in 1966 and the New Brunswick Amateur Hockey Association in 1968. 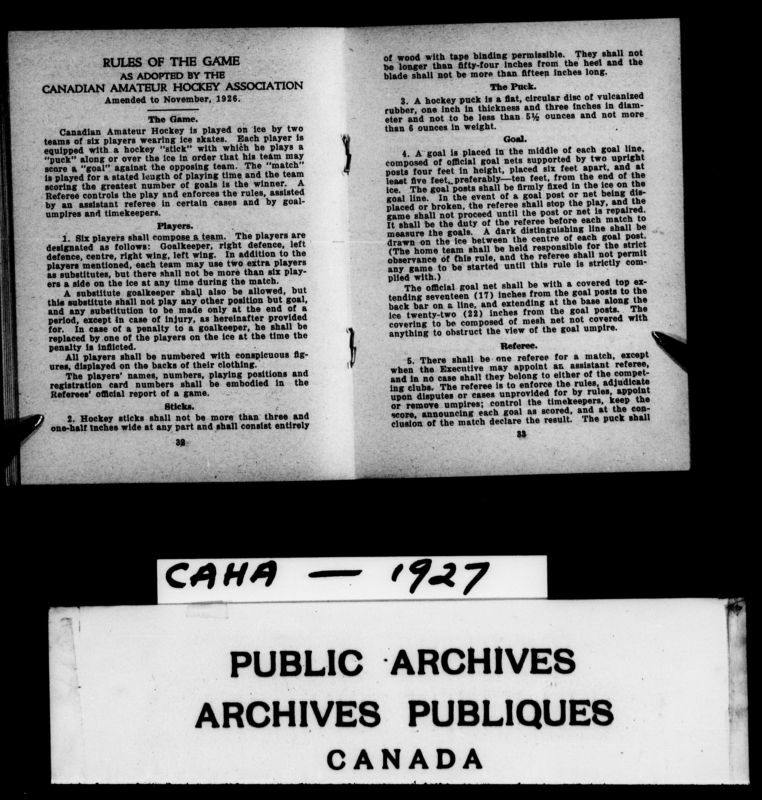 Library and Archives Canada, in partnership with Canadiana.org, provides digital access to some of the important records from the CAHA fonds such as the official rule books governing amateur hockey going back to 1927. In 1994, the CAHA merged its activities with the Canadian Hockey Association, better known as Hockey Canada, which had been created in 1968. The new organization’s mandate was to select teams to represent Canada in international competition and to foster the development of skills in Canadian hockey players. 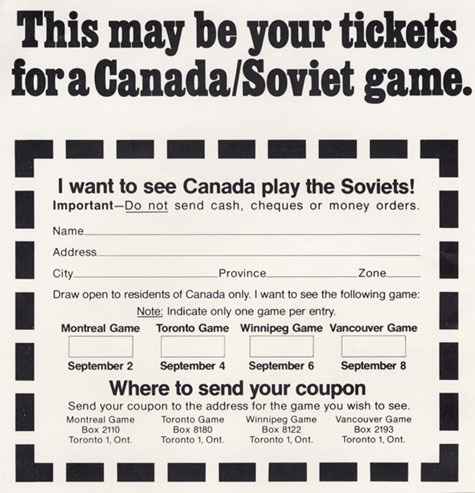 LAC’s Hockey Canada material documents many international hockey series and tournaments, which captured the attention of all Canadians such as the 1972 Summit Series and the 1976 Canada Cup. 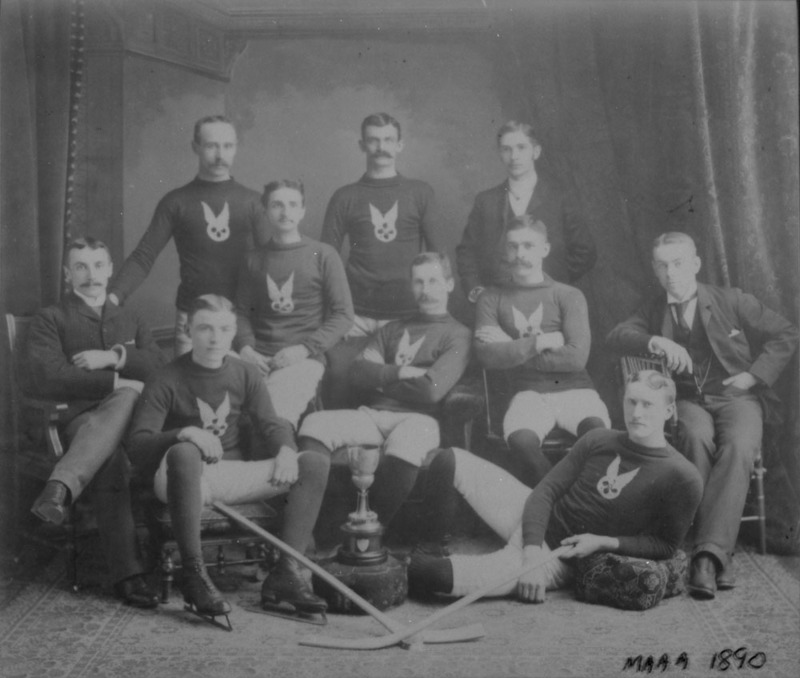 You can discover the evolution of hockey in Canada by exploring LAC’s records of Hockey Canada and its predecessor, the CAHA. Also, be sure to explore the Hockey Hall of Fame, which has the largest collection of hockey history resources, and visit its new exhibit co-produced with LAC, The First World War and a Century of Military Ties to the Game. Canadian hockey stars were not immune to the call to duty when the First World War erupted in 1914. In fact, the strong young men who made up teams across the country represented the prime demographic for potential soldiers and helped promote the war as the ultimate game an athlete could play. Developed in partnership with the Hockey Hall of Fame in Toronto, the new exhibition Hockey Marching as to War: The First World War and a Century of Military Ties to the Game recounts how the First World War impacted hockey players and transformed organized hockey during and after the war. The 228th Battalion (Northern Fusiliers) was formed in 1916 and fielded a battalion hockey team who played for the National Hockey Association (NHA). The battalion included 12 professional or semi-professional hockey players. Ultimately, the team was a publicity stunt used to encourage recruitment, to boost morale and to deal with the shortage of players in the NHA during wartime. 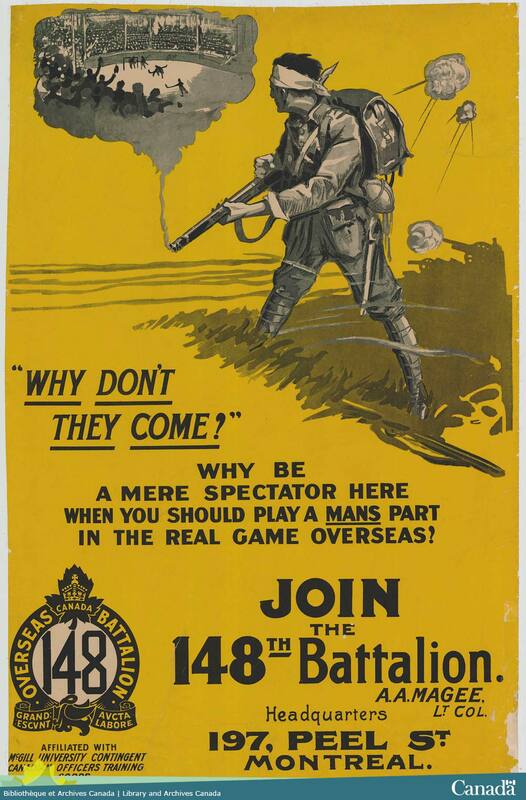 But when the battalion was eventually called to the front, scandal erupted as it was revealed that some players were promised they would never have to go to war. Those players who went abroad found themselves assigned to a construction unit, building rails for the next two years. 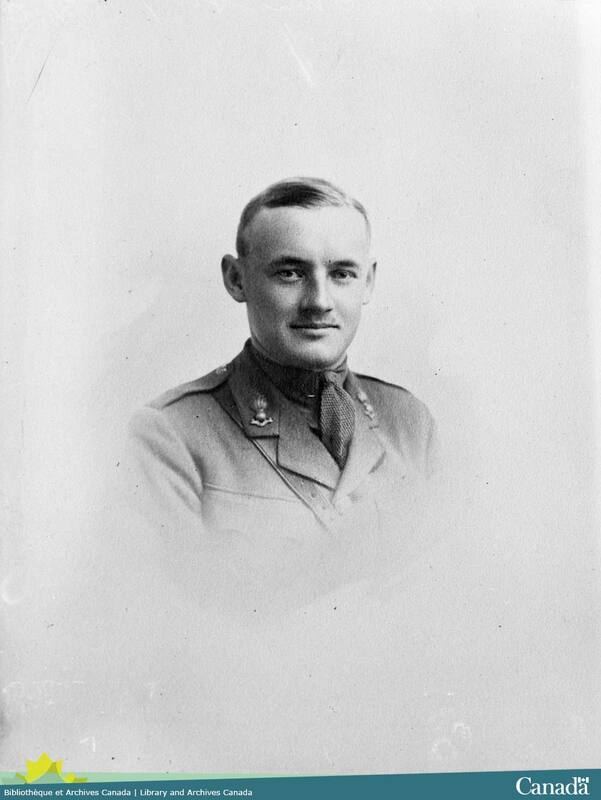 Hockey legend Conn Smythe enlisted in 1915, a week after winning the Ontario Hockey Association championship. 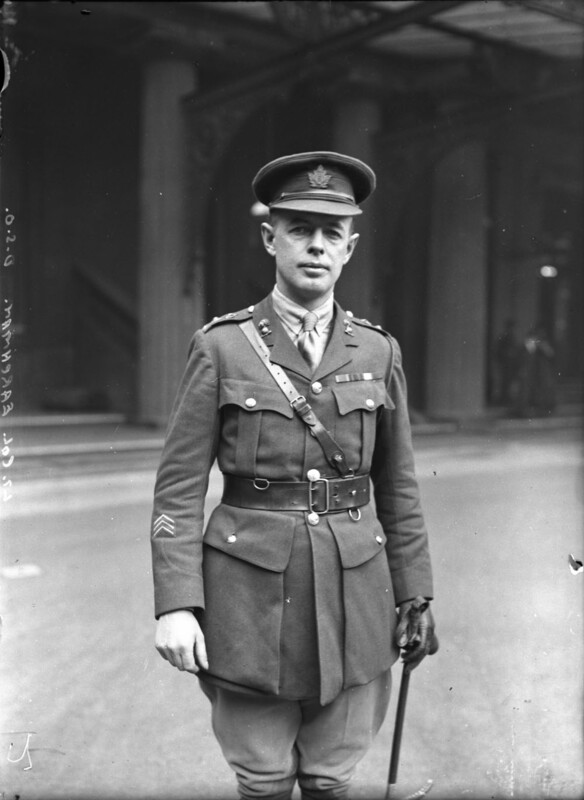 Smythe served in the Canadian Artillery, earning the Military Cross, before being transferred to the Royal Flying Corps in 1917. He then served as an airborne observer until being shot down and captured. Despite two escape attempts, he spent more than a year in a German prisoner-of-war camp. 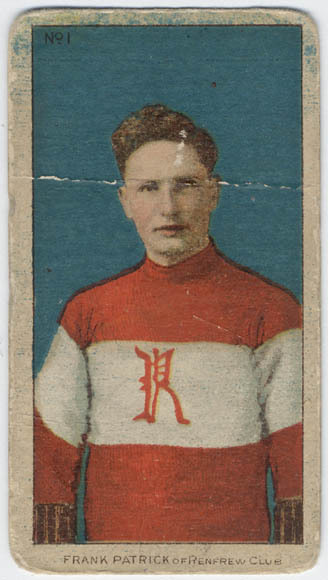 Smythe would later go on to become principal owner of the Toronto Maple Leafs. “One-eyed” Frank McGee, as he was known, enlisted in the army in 1914 despite having lost his left eye more than a decade earlier. McGee supposedly bluffed his way through the medical exam by trying to memorize the vision chart with his good eye. 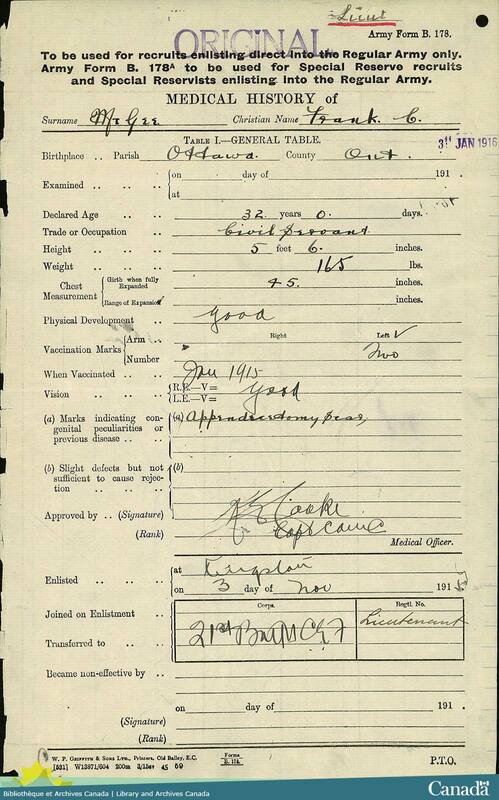 The doctor wrote “good” on his medical chart for McGee’s right eye, but left the assessment of his left eye blank—perhaps not wanting to tell the league’s top scorer that he was unable to fight for his country. If you’re in Toronto, check out the exhibition at the Hockey Hall of Fame until February 2015! Below is a selection of children’s books inspired by Canada’s passion for its national winter pastime, hockey. 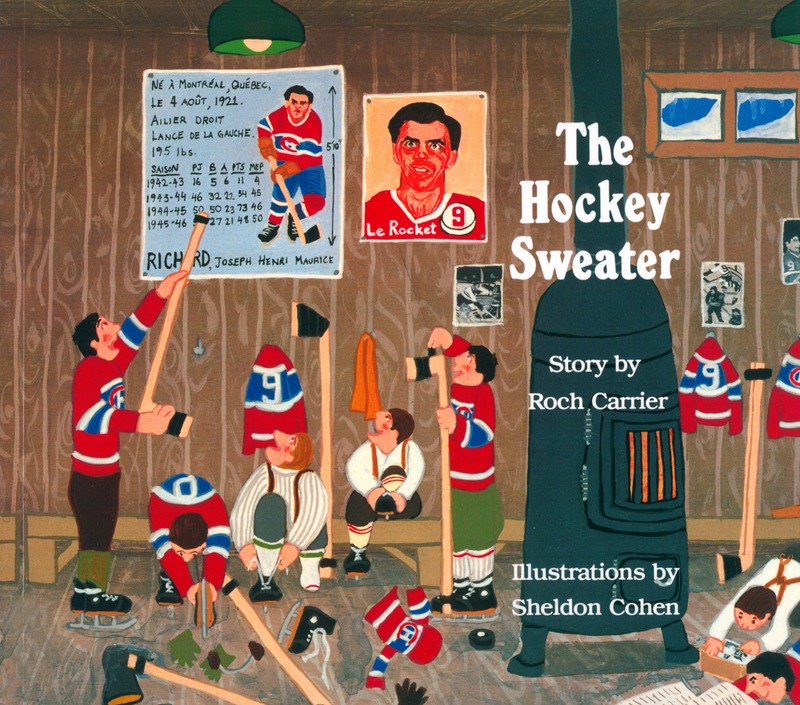 Le chandail de hockey, by Roch Carrier, is a Canadian children’s literature classic. Generations of children have read about the misadventures of the young narrator, who is forced to wear a Toronto Maple Leafs sweater instead of the Montreal Canadiens’ number 9 immortalized by Maurice Richard. Written in 1970 for radio, the story was translated by Sheila Fischman (AMICUS 20121258). The original French version, Les enfants du bonhomme dans la lune (AMICUS 877142), and the English translation, The Hockey Sweater and Other Stories (AMICUS 905257), were published in 1979. The story inspired Sheldon Cohen’s animated film, The Sweater / Le chandail, produced by the National Film Board. Sheldon Cohen then illustrated the 1984 storybook, published by Tundra Books (AMICUS 5003239). Did you know that a copy of The Hockey Sweater travelled to the International Space Station in 2009, and that Abigail Richardson composed a symphony based on the story? 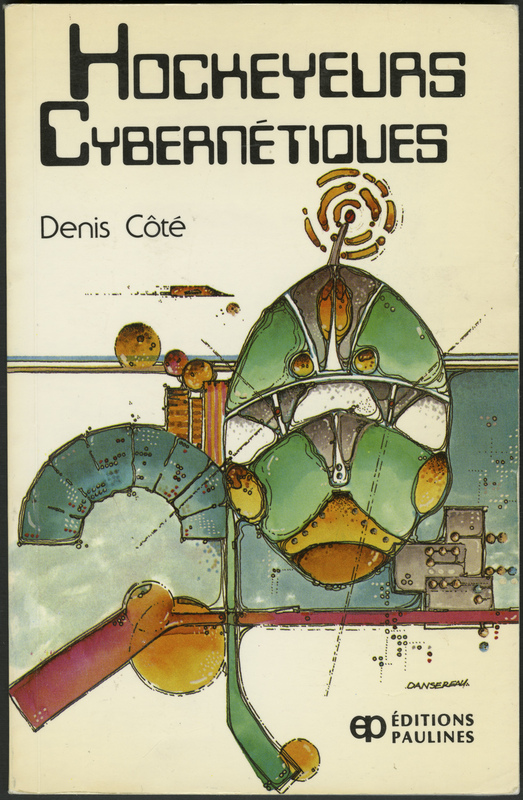 Other hockey-related books include the Hockeyeurs cybernétiques (AMICUS 3970428), which brings together the complete science fiction series by Denis Côté, published in 1983 and again in 1993 under the title, L’arrivée des inactifs (AMICUS 12293147). The new edition uses the original title. The hero of the story, Michel Lenoir, is a beloved hockey star who is used by a dictator to control an exploited population. The sport-recreation aspect of hockey is used as a backdrop to reveal an insensitive and programmed futuristic society. In the 22 novels of The Screech Owls series (AMICUS 28705721), by sports journalist Roy MacGregor, readers follow a peewee hockey team on their adventures at tournaments. The Screech Owls travel throughout Canada, and even attend the Olympic Games in Nagano, Japan, and in Lake Placid in the United States. The majority of hockey-themed children’s books have been aimed at boys. However, the international reputation of Canada’s women’s hockey team has also inspired female characters. 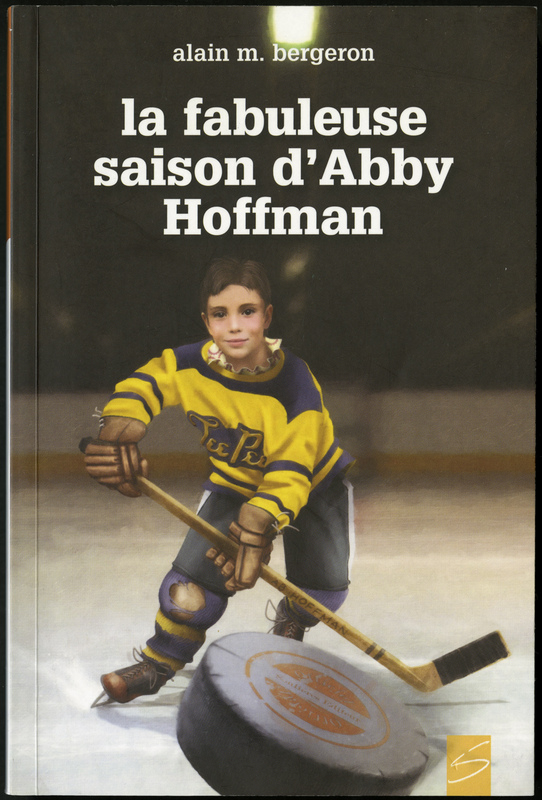 La fabuleuse saison d’Abby Hoffman, by Alain M. Bergeron (AMICUS 40395119), tells the story of Abigail Hoffman, who as a little girl in Toronto in 1955, pretended to be a boy so she could register for Little League hockey. 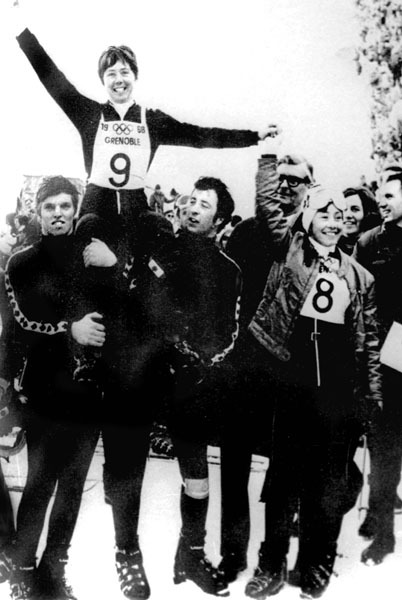 Later in her athletic career, she competed in the women’s 800 metres at the 1964 Tokyo Olympic Games, the 1968 Mexico City Games, the 1972 Munich Games, and the 1976 Montreal Games, at which she was Canada’s flag bearer. “Denis Côté : Le bon et le mauvais côté des choses,” appearing in Lurelu in 2013, by Marie Fradette (AMICUS 829835). Mystery at Lake Placid, by Roy MacGregor (AMICUS 16776029). 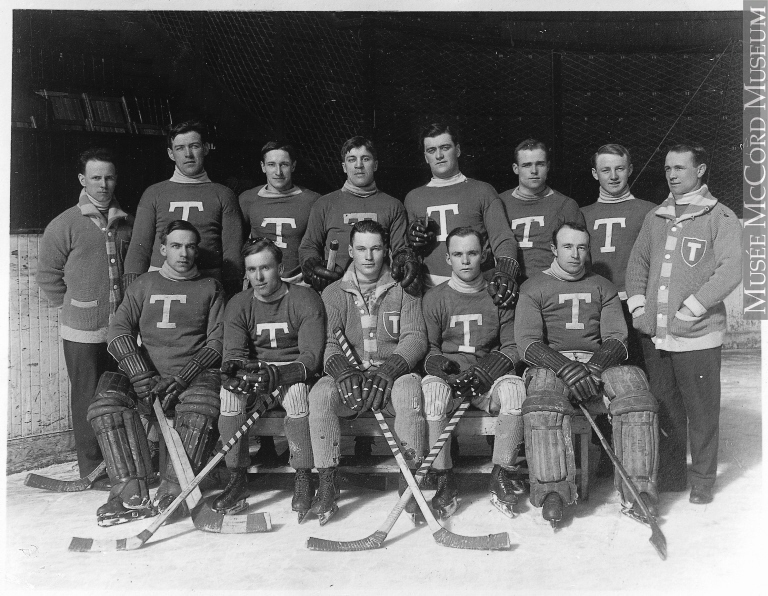 The Sochi 2014 Games mark 90 years of Canadian athletes representing their country on the Winter Olympic stage. Canadians have competed in all Winter Olympics, starting with the first Games in Chamonix in 1924. Canada is also part of a handful of countries that have won medals at every Winter Games. 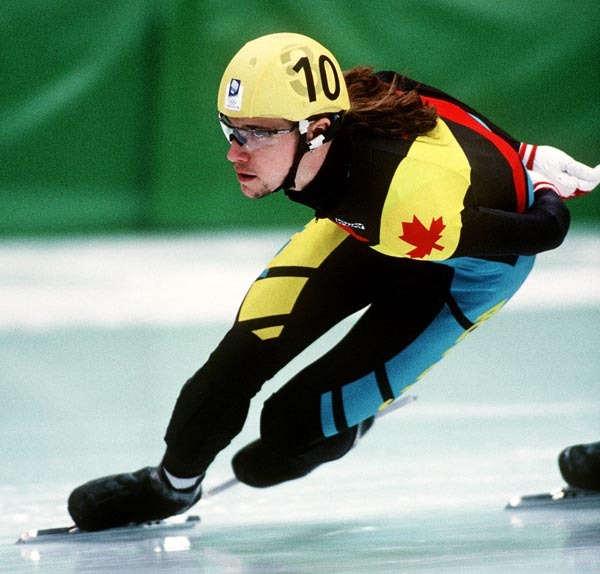 Library and Archives Canada holds a rich collection documenting memorable Canadian performances at the Games, the athletes behind these achievements, and the historical development of winter Olympic sports disciplines in Canada. The Canadian Olympians site provides a visual history of Canada’s participation in the Games. It consists of more than 10,000 images of athletes who participated in the Winter and Summer Olympics, from the early 1900s through 2004.